On Christmas Day my family indulged in a gigantic Christmas lunch with all the trimmings. Afterwards, we sat back, entered our food coma’s and emerged from them around the same time the Griswalds realise their Great Aunt has wrapped her cat as a Christmas present. Now, I don’t know if it was jelly-soaked wrapping paper, the deflating Turkey or the flow of toxic camper-van toilet waste into the gutter, but it was at this time that my brother announced it was time for his annual Pork and Cheese toasted sandwich. In this particular sandwich my brother attempts to fit as much leftover pork, gravy, vegetables and cheese as possible, on a sandwich without incurring the much feared toastie-blowout. The toastie-blowout is a catastrophic Australian-ism thats possible occurrence will strike fear into the hearts of even the most fierce and weathered tradies, not dissimilar to the fabled “Drop Bear”, it is where your cheese and filling squirts out of the sandwich only to bake onto your jaffle maker. Life can be so cruel. Upon him entering the kitchen, banshee-esque screams could be heard throughout the neighborhood as he realised there was no bread he could eat, he is allergic to yeast. DUN-DUN-DUUUUN. 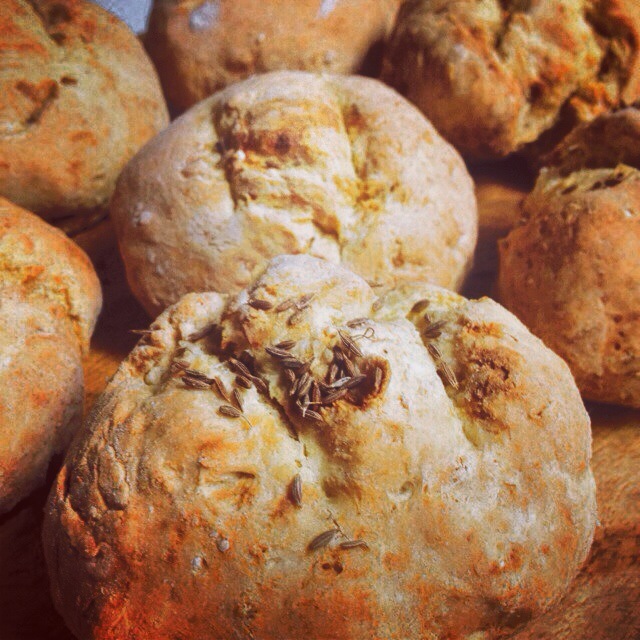 Being the wonderful and modest sister I am, I stepped in and decided to whip him up a batch of yeast-free soda bread. Recipe below in case you ever find yourself or a loved one in such circumstances, or if you simply want some delicious bread. Preheat fan-forced oven to 180°C. Combine the flour, bicarbonate of soda, salt, onion powder, garlic powder, ground cumin and 1 tablespoon of the fennel seeds in a bowl. Rub the butter into the flour until it resembles fine breadcrumbs. Make a well in the centre of the flour mixture. Add the milk and vinegar and use a round-bladed knife in a cutting motion to mix until the mixture starts to come together. Use your hands to bring the dough together in the bowl. Turn onto a lightly floured surface and gently shape into a ball. Use your hands to roll the dough into a 40cm-long log. Cut into 8 equal portions. Shape each dough portion into a ball and place on a large baking tray. Use a sharp knife to score a cross into the top of each ball. Sprinkle with remaining fennel seeds. Bake in oven for 25 minutes or until the bread is golden and sounds hollow when tapped on the base. Serve warm with butter. Thank you – they were so delicious!